Freeze Substitution is a process for low temperature dehydration and fixation of rapidly frozen cells that usually takes days to complete. With the amazing work of K.L. McDonald and R.I. Webb1 they have now introduced a new method for freeze substitution with a basic kit that we are proud to offer. 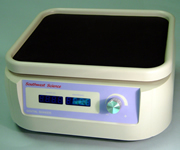 With this unique kit researchers are now able to achieve excellent freeze substitution results in as little as 90 minutes for cells of small volume such as bacteria and tissue culture cells. For those cells of greater volume or that have significant diffusion barriers such as cuticles or thick cell walls, one can extend the time to 3 hours simply by putting a lid on the box. Cool the metal block by submerging completely in liquid nitrogen in the ice bucket. Leave for 5 minutes or until the "boiling" stops. In a separate box, transfer samples into cryovials with frozen fixative, keeping everything at liquid nitrogen temperatures. Seal tightly and be very sure that there is no liquid nitrogen trapped in the vial. Trapped liquid can cause the vials to explode upon warming. It is best to use a room temperature lid when sealing the tube. 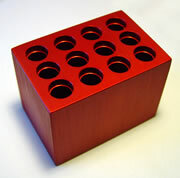 Put the vials with samples into holes in the cooled metal block. Go to a PC (Macs won't work) that has the Lascar datalogger software installed and name and start the program. Pour off the liquid nitrogen from the block and box, making sure not to let the cryovials come out of the holes in the block. Arrange the block so the cryovials are horizontal and put the tops of the vials against one side of the foam box. Use a piece of foam or wadded up paper behind the block so it keeps the vials from falling out of the block during shaking. Turn on the shaker at 100-125 rpm and allow it to gradually warm until the temperature is at least 0°C before removing the vials for rinsing and resin infiltration. This operation should take place in a fume hood in case there is any leakage of osmium-acetone from poorly sealed vials. Freeze substitution will take about 2 hours with the lid off, and about 3 hours with the lid on (though this may vary from lab to lab). Remove the vials from the metal block and place them onto a rocker at room temperature and wait until they come to about 20°C, then stop the datalogger and save the files. Rinse out the fixative with 3-4 rinses in acetone and proceed to infiltration and embedding. 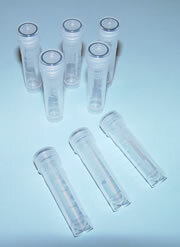 Take care opening the vials as pressure built up inside can cause a spray of the freeze substitution media. Tobacco leaf prepared by the quick FS method (Webb & McDonald, 2011). Abbreviations: N = nucleus; Ch = chloroplast; CW = cell wall; Cy = cytoplasm; ER = endoplasmic reticulum; V = vacuole; and, G = Golgi apparatus. Bar = 0.5 µm. 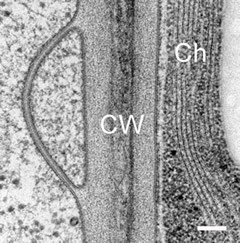 Tobacco leaf prepared as above showing details of the cell wall (CW) and chloroplast (Ch) and cell membranes. Bar = 100 nm. In well-frozen samples the water molecules are not likely to move around very much, even as the temperatures rise to a point where you would expect hexagonal ice (Dubochet, 2007). Agitation should speed up the substitution of acetone for water molecules in much the same way that agitation speeds up development of film. Water in the substitution mixture does not appear to slow down substitution as was once believed. In fact, it is known to help membrane contrast (Buser and Walther, 2008). Does it work for all samples? If a sample can be successfully freeze substituted by the old methods, then the quick FS method should work just as well. McDonald and Webb have used this procedure with complete success for over a year and a half for all the samples they have freeze substituted. If samples show evidence of ice damage then it is because they were damaged during freezing and not during freeze substitution. Typical temperature curves using the EMS Freeze Substitution Kit. With the lid OFF the time to 0°C is about 2 hours. With the lid ON the time is about 3 hours. Results may vary depending on the particular setting of the shaker. For example, hood air flow can have a definite influence on the shape of the curves. 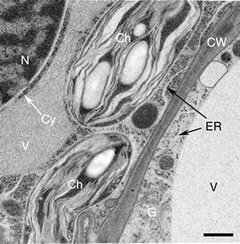 Cross-section through nerve cells in the head of C.elegans. 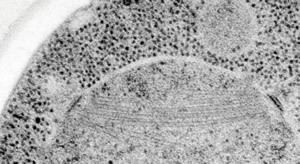 A BHK cell processed in 90 minutes by the quick FS method. 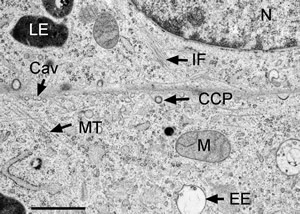 Abbreviations: CCP = clathrin-coated pit, Cav = caveolae, EE = early endosome, IF = intermediate filaments, LE = late endosome, M = mitochondrion, MT = microtubule. Bar = 1 µm. Modified from McDonald and Webb (2011). Mitotic spindle microtubules and spindle pole bodies in the budding yeast, Saccharomyces cerevisiae. The equipment should be used in a fume hood in case there is a leak of osmium-acetone during a run. We suggest doing a trial run with acetone only in the cryovials to make sure that they are sealed correctly. When sealing cryotubes that contain frozen fixative and sample, use a warm cap so that the O-ring is flexible and gives a good seal. Take care when removing the caps after a FS run because there is some pressure built up inside the cryotubes and you can spray osmium/acetone on your hands if you are not careful. Cover the cap with a piece of lab tissue when removing and wear gloves. Dubochet, J. (2007). 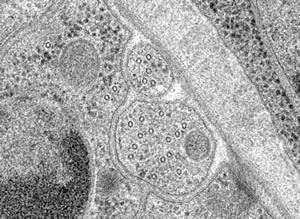 The physics of rapid cooling and its implications for cryoimmobilization of cells. Meth. Cell Biol. 79, 7-21. Buser, C., & Walther, P. (2008). Freeze substitution: the addition of water to polar solvents enhances the retention of structure and acts at temperatures around -60°C. J. Microsc. 230(2), 268-277.